Barry Trotz is a moron. Granted, this is just an assessment based on his own comments during this series, but if he was trying to convince anyone that he knows what he's talking about then Trotz is failing miserably. When originally asked about Brooks Orpik's hit on Olli Maatta following Game 2, Trotz parroted the usual nonsense when a coach is put in the position of commenting on the indefensible actions of one of his players - he thought the rebound was coming out to Maatta, despite the improbably angle that would require and Maatta showing no indication of going after a puck. There's a size difference and Olli Maatta was leaning a bit, as if that vindicated Brooks Orpik from swerving to throw an elbow into Maatta's head. Trotz: "I’m disappointed, but I’m not surprised based on who we’re playing and all that." Asked to clarify, "Take it for whatever you want." Apparently, that nonsense would just be a warm-up for after Orpik's 3 game suspension was handed down. Orpik, to his credit, took responsibility for his actions and didn't try to justify what he did on that play. It's certainly a leadership he didn't learn from his current head coach. When reached for comment by Zac Boyer of the Washington Times, Trotz suggested that the reason for Orpik's 3 game suspension was because the Capitals were playing the Pittsburgh Penguins, and the NHL goes out of their way to protect them. Of course, he did say to take it for whatever you want, so I'm taking it in the only way someone can - that Barry Trotz is a moron, as mentioned earlier. Apparently he hasn't been watching the series too closely either, otherwise he'd have seen a far different picture than the one he tried painting. If the league was going out of their way to favor the Penguins, then surely the refs should have given Tom Wilson a 5 minute major and a game misconduct for his knee-on-knee hit of Conor Sheary in Game 1. After missing that golden opportunity, surely they would have pounced on ejecting Brooks Orpik after a dangerous headshot four minutes into a Game 2 the Penguins really needed to win, not wait until afterwards to deal with him. If there's one thing that Barry Trotz is ahead of the curve on, it's giving the Washington fanbase a scapegoat for a potential elimination at the hands of the Pittsburgh Penguins. Surely he was paying attention to the first two games and noticed that his team had no answer for the Carl Hagelin-Nick Bonino-Phil Kessel third line. He had to have noticed that the Capitals were damn lucky to have even been in a position to tie Game 2 given how lackluster they played in the offensive zone. And he has to be frustrated beyond belief that the Caps haven't been able to knock the Pens off their games despite the borderline, and well beyond, physicality. The biggest problem for the Capitals is that Barry Trotz is a defensive minded coach, so his solution to the majority of problems is going to be defensive-based. It certainly was his response in Game 2 to the back and forth action in Game 1, and it's a huge part of the reason the Capitals recorded only 10 shots on goal during the first two periods. 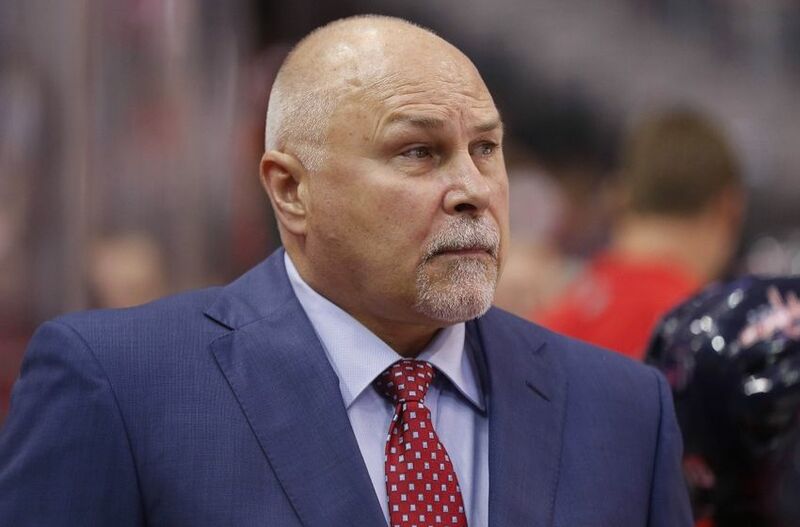 Trotz is dangerously close to implementing a game plan that will all but seal Washington's playoff fate, but it's no surprise coming from a coach that has won a grand total of 4 playoff series during his 17 years as an NHL head coach. Maybe the franchise that hasn't been able to ever win anything deserves that type of coach too, but based on his moronic comments Barry Trotz certainly deserves his team of cheapshotters that he so desperately goes out of his way to defend.